On Friday, we went shopping at the Navy Exchange, and then we decided to grab something for lunch before heading to the San Diego Zoo. We were just planning on going to the IHOP Express in the food court, but as we were walking down the sidewalk to the food court, a sign in the middle of the sidewalk caught my attention. 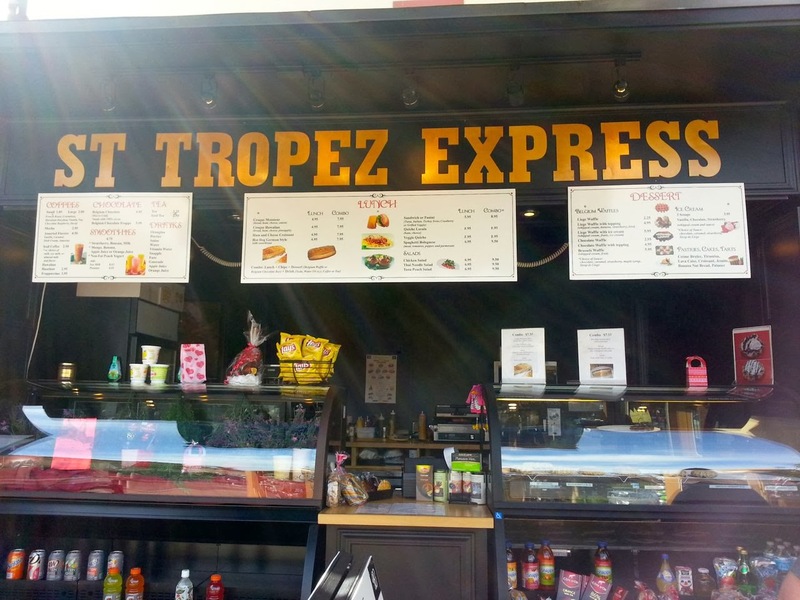 There was a little sidewalk café-type restaurant called St Tropez Express, and they advertised a lunch special where you get either a Croque Monsieur or a Croque Hawaiian with chips, a drink and a Belgium Waffle. Yum! My husband and I decided to share the combo special. 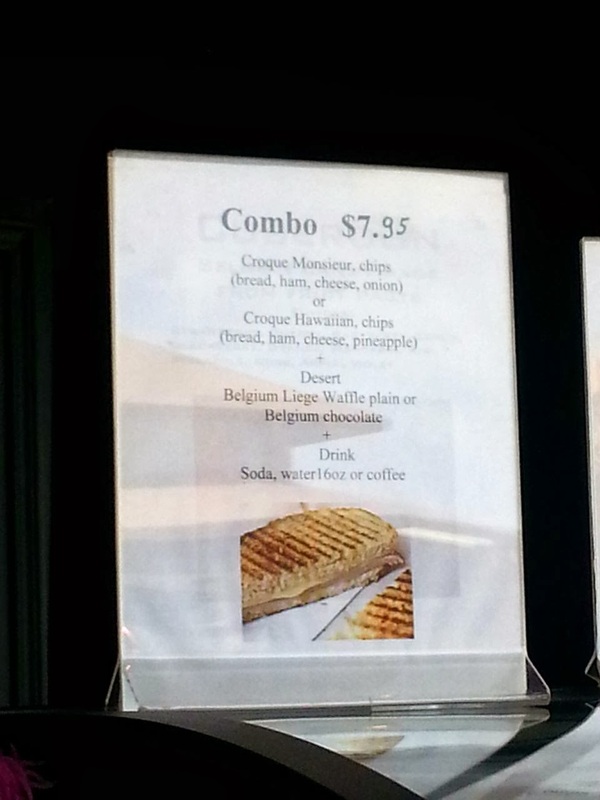 We ordered the Croque Monsieur, which came with ham, cheese and onion grilled on bread. We decided to try the plain waffle instead of the chocolate waffle (we had our choice), and my husband chose A&W 10 for the beverage. I had a water bottle with me, so I didn’t need a beverage. The lady working there was nice enough to cut the sandwich and the waffle in half for us. 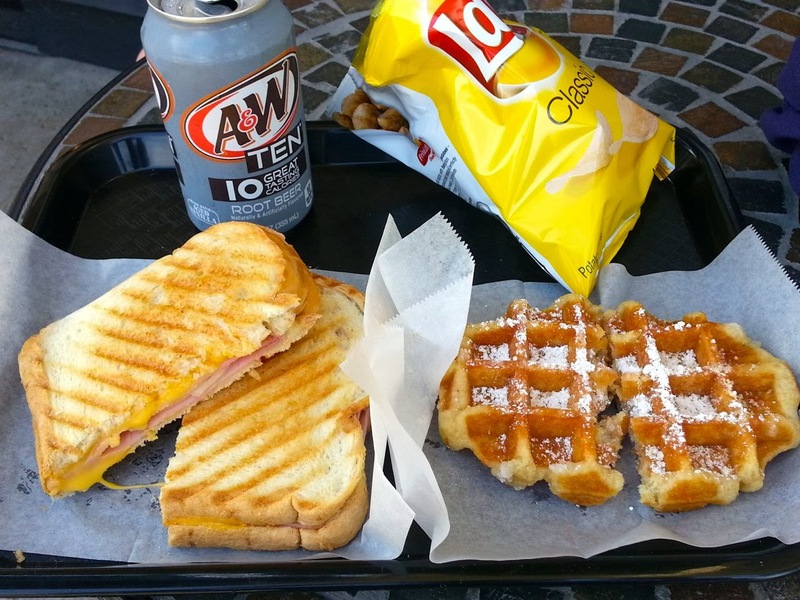 She freshly assembled and grilled the sandwich, and the dusted powdered sugar on top of the waffle before warming it up. There were several little tables on the sidewalk. We chose one near the counter that had a small orange tree nearby. French music was playing from the speakers. My husband mentioned that he felt like we were in Europe or somewhere more special than a Navy base in San Diego. I agreed. It felt like we had escaped far from home for that brief moment in time. It was really pleasant, and the food was delicious. The Croque Monsier was filling, and the flavors were great together. I’d never had onion on a ham and cheese sandwich before, but I’d make it that way again. 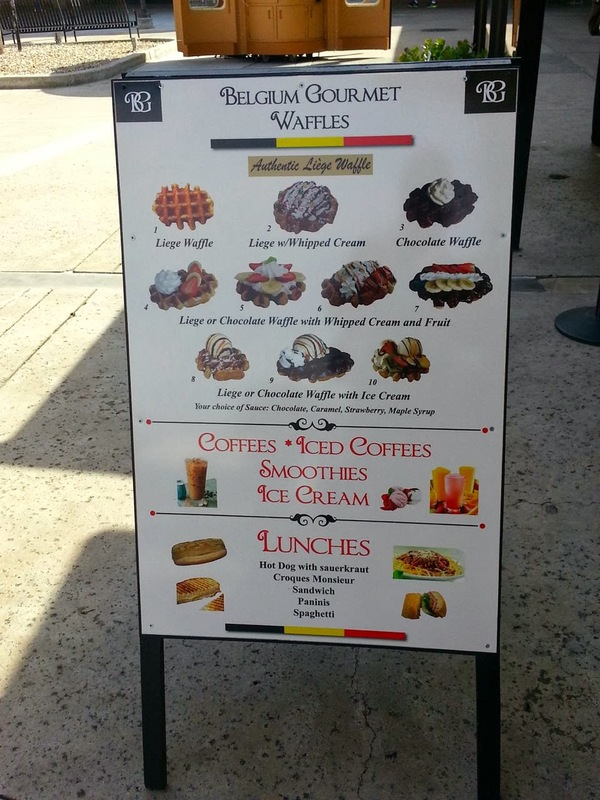 The waffle was very sweet. It almost tasted like a cake doughnut. It was a little too sweet for me, so my husband ended up eating most of that and let me eat most of the sandwich. It was a very pleasant lunch. Next time we’re in San Diego, we will make a point of eating here.